Are you looking for a gym with the best services and amenities? At American Family Fitness we believe we are that gym! With all we have to offer, you’ll never need another health club again. 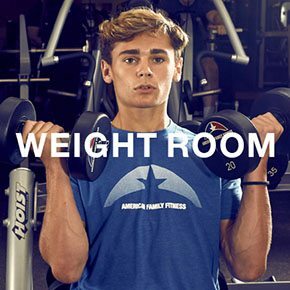 American Family Fitness is your go-to gym for the best health and wellness amenities in Fredericksburg. Our equipment is top-of-the-line, and you’ll find all of the tools you need for cardio, strength, and functional training. We have plenty of group classes and small group training, all throughout the week for your convenience. Our gym in Fredericksburg also provides onsite childcare for members, refreshing locker rooms with steam rooms, and a cafe for snacks. There are kids’ camps and adult sports leagues, too, and it’s all here under one roof! Get the most out of your time and effort. Members can begin with a personal consultation with a trainer at our gym. Are you constantly pushing for the optimal cardio workout? At our gym in Fredericksburg we have options for all ages and fitness levels. Proper cardio training can increase your heart rate and help you burn fat. Oxygen is then distributed more optimally within the body and increases energy levels. 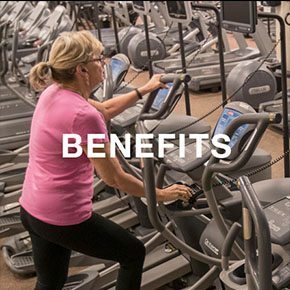 With access to our many treadmills, bikes, ellipticals, and stair climbing machines you will be able to blast past every goal you’ve made. Have you been working towards developing an optimal strength program, but don’t know how? At the best gym in Fredericksburg you have access to top-of- the-line equipment, including free weights, to help you reach your goals. Strength training done correctly helps protect joints, burn fat, and increase energy. Come in and start today! Are you always looking for time to exercise but come up empty? 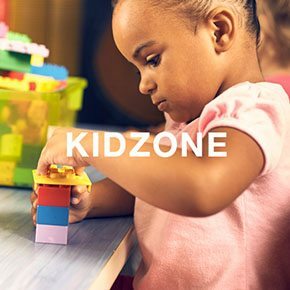 At our Fredericksburg gym we have the KidZone, a place for you to drop off your 6 week - 13 year olds to safely play for two hours while you enjoy some “me” time. At the KidZone, children have access to a variety of age-specific classes and play areas, so leave them with us while you work out.